But is confirmed that you gain only 1 spell on lvl up? Maybe it can just be like chiper powers in poe1: you alternate by choosing 1 or 2 new powers every level. In that case the problem would have been much more mitigated. This table and video shown in the multiclass II update and a few of Josh's explanations to building a battlemage on his tumblr extremely suggest it. Spells share the same UI and share the +1 per level class ability cost at level up with class talents (and going by the battlemage example, general talents as well, because I do not believe Weapon&Shield is exclusive to the Fighter). That means you can have a max of 20 spells for single classed or 27 for certain multiclassed combo, if you do not take a single talent. Take the Monk/Wizard in the multiclass video: it has 6 monk abilities and 16 spells, so a total of 22 visible class abilities. The top spell level is 7th, that means the character is level 19th or 20th. Wizard have grimoires that add spells (only 4 I believe?). Cast per spell level was reduced to 2 too, so a max level multiclassed character will be able to cast 14 spells per encounter, while a pure class will be able to use 18. Edited by morhilane, 23 September 2017 - 04:35 AM. This thread can now be updated with all the wizard and monk subclasses (recently revealed in the video). I thought the Transmuter wizard class was particularly interesting. You can turn into an orge! That sounds like a fun ability for a low level wizard. Not just Wizard and monk, the update contains a list of all subclasses along with brief descriptions. I really hope that the ogre levels with you, can profit from self buffs like Martial Power and maybe even retains the weapons (armor and headgear might be suicidal ). Otherwise it would only be a nice gimmik at game start and then it would be moot. Like the ranger's pet and druid's spiritshift were in PoE1 until they patched them. Edited by Boeroer, 23 September 2017 - 11:33 PM. I feel like Helwalker like this would be the go to multi class option for passive builds, retaliation, chanter burning, whatever, if it stays like this. With all these options for sub classes and multi classing I'll probably never be able to finish this game because I'll be stuck in an infinite rerolling loop to try out different combinations. Edited by Climhazzard, 23 September 2017 - 11:52 PM. Yes, it sounds like a great subclass for a Fire Godlike and to multiclass it with a priest in order to stack the MIG bonus with Aggrandizing Radiance + Minor Avatar, or with a Berserker or Streetfighter. Edited by Boeroer, 24 September 2017 - 12:05 AM. IIRC from the video the Helwalker also takes extra damage while wounded. Yeap, the Helwalker, Nalpazka and wizard subclasses do appear slightly different in update #40 video in comparison to update's post. In case of Helwalker - he takes 5% extra damage per wound he has. So that Might bonus comes at a hefty cost. But this you can counter with Iron Wheel I guess...? Edited by Boeroer, 24 September 2017 - 05:41 AM. Iron Wheel + Fire Godlike + multiclassed to Street Fighter seems like a potentially interesting combination. Exactly. Or like I said: priest if the MIG bonus stacks with Minor Avatar. Imagine Shining Beacon with +18 or even +20 MIG. The only thing i "miss" is that since there is a "reverse monk" ( gain wounds doing dmg) i would have like to see a "reverse chiper" ( gain focus as you get dmg). Obviusly i'm already thinking about how to adapt the monk retaliation build to deadfire 😁. Obviusly i'm already thinking about how to adapt the monk retaliation build to deadfire . Which would particularly synergize with melee pain link builds. Could be too strong. Ascendants’ effective Power Level is lower when they aren’t at Max Focus. So if you want to use any power when you aren’t maxed out, it’s strictly worse than if it were used by a pure cipher. It's like the last update wasn't up-to-date. So many stuff missing from the sub-class one liners. I'm starting to think that the Darcozzi Paladini are really 3 level behind* everyone else all the time for a pitiful Fire Shield on Lay on Hand at this point (I was speculating that it was just their zeal resource that was lower and not their power level). On top of it, it is starting to look like the Wizard specializations don't have enough negatives for their positives. They get to keep casting their specialized spells at 3 level higher (Empowered) all the time at no cost. The school restrictions just limit how you can use the specialized Wizards, not their effectiveness. All that tells me is that the "power level" effectiveness increase is going to be marginal, otherwise all the subclass with lower power level most of the time are going to be dead ends (and we know Josh doesn't like dead ends). *-1 power level = -2/-3 class level depending of the level range, although power level stagnate a bit as your class level up so they are just 1 power level behind all the time. Edited by morhilane, 30 September 2017 - 04:18 AM. Yeap. This, helwalker's increased incoming damage, and wizard subclass details were not reflected in the text list of update #40. Personally I understood it as if their power level remained the same, but the resource pool (max zeal) was lowered. But now that I re-read it: "Lay on Hands (Flames of Darcozzi Palace) creates a flame shield around the paladin. Lower Zeal power." - I find it ambiguous. 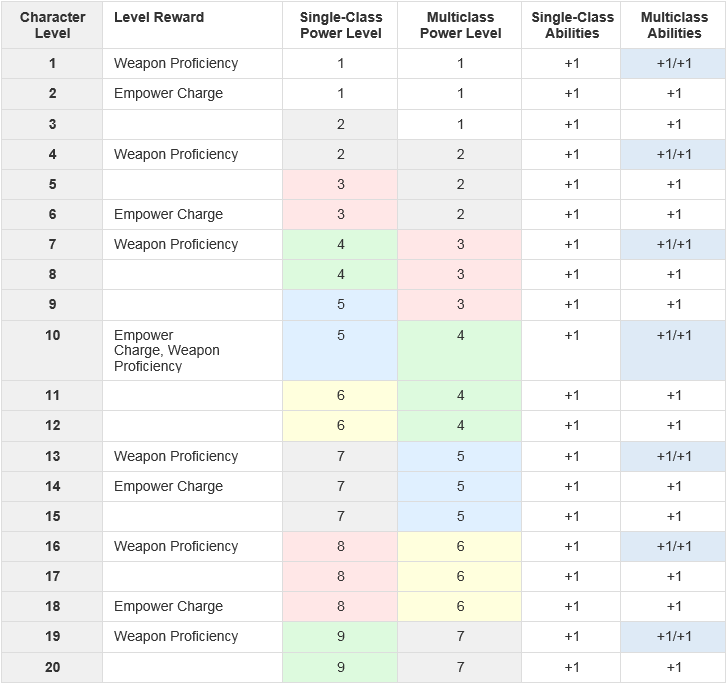 The new multi-classing system does not need as aggressive [power-level related scaling] as the previously announced system did, because it's no longer possible to dip into another class. Having +1 power level could as well increase the damage by just 5-10%. Edited by MaxQuest, 30 September 2017 - 06:05 AM. We've seen mentioned the arcane knight, ghost knight, and goldpact knight. Will there be a knight subclass of fighter? That is, a fighter that follows the chivalric code and is skilled in the weapons and armor of mounted combat. They've posted all of the subclasses. Goldpact Knight is a Paladin subclass. No "Knight" fighter subclass though. Shieldbearers of St. Elcga - Lay on Hands (St. Elcga's Grace) prevents the target from being knocked out for a short duration. Cannot use Lay on Hands on self. - Cannot multiclass with priests of Skaen, Magran, or Wael." Is just me or all paladin orders seem to have bigger disadvantages then bonus? I'm kind of wondering what "Stride" means. Is it just movement speed? That would be a weird way of phrasing it. So it might be a new thing.